On-the-go professionals spend their time out on the road, visiting existing and prospective customers and need comfortable and reliable solution to never miss a call. What is UC and MS certification? UC stands for Unified Communications and describes the integration of enterprise communication services, meaning the audio solution is optimized for use with all leading UC-vendors like Cisco, Avaya and more. Skype for Business-certified devices have undergone specific certification by Microsoft. A snug, in-ear fit blocks background noise to help you focus; 3 sizes (S/M/L). For easy and comfortable position around the neck. i.e. when the earbuds are connected, music will pause or call will be ended. A convenient, lightweight, around-the-neck design. A built-in busylight acts as a "do not disturb sign". Inward facing buttons for easy and convenient call management. A mute button for instant microphone (un)mute and one touch access to voice assistants. For easy and comfortable position around the neck. i.e. when the earbuds are connected, your music will pause or your call will be ended. 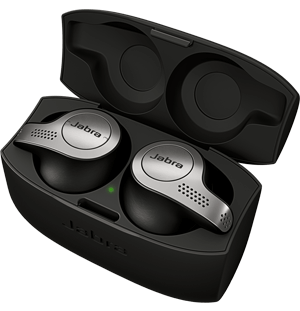 Up to 30m/100ft with computer using Jabra Link 370. Up to 10m/33ft with mobile devices. Yes. Evolve 65e has world-class speakers that are built for both voice and music. 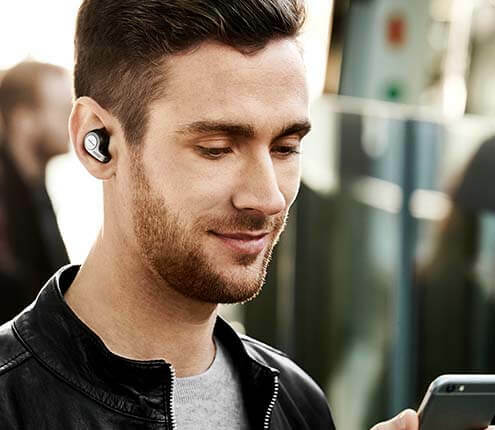 For more frequently asked questions please visit the Jabra Evolve 65e support page.